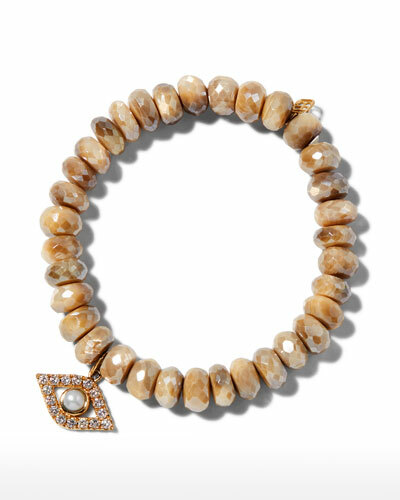 What gives your jewelry its strong sense of individuality? I firmly believe the traditional rules were meant to be broken! When I was about sixteen I recall making a decision not to conform, but instead to do things my way. My jewelry is all about personalization and letting the customer create their own unique sense of style, adding a personal element to an otherwise basic wrist of fine jewelry. My red coral beaded hamsa bracelet. My mother would sew a red thread into my clothing to bring me good luck and protect me from the evil eye. This piece honors that tradition. My children, Sydney & Evan, every day. And the '70s, but now even more by bell bottoms, rainbows, turquoise, peace, and love. Your brand in three words? Puka shell and turquoise necklaces and bracelets in junior high that I would sell to my friends. The first pieces I designed for Sydney Evan were white-gold diamond horseshoes, wishbones, and evil eyes. What's your brand's signature piece? Definitely my "Love" necklace. It's created from my own handwriting. 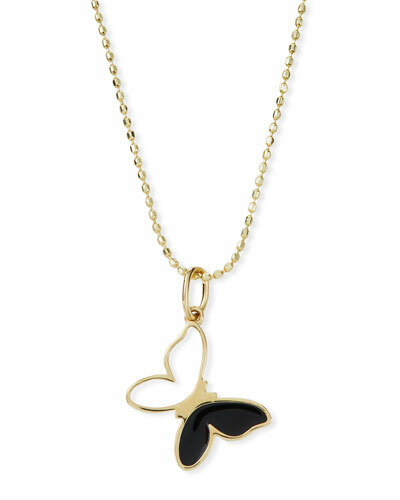 I like it best layered with longer, varied charm necklaces. What does jewelry say about the woman who wears it? A lot! A lot of color and more whimsical pieces show me they're playful. 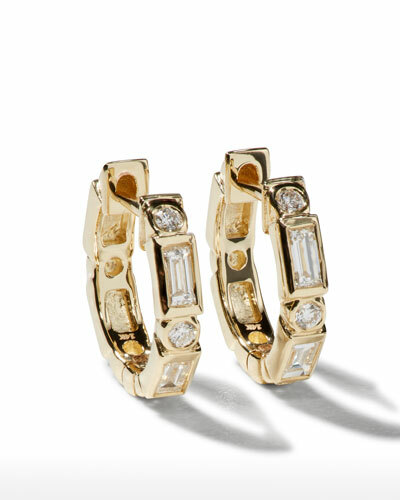 More traditional styles like discs, bars, or angular pieces tell me they have a classic sensibility. This year marks the brand's 15th anniversary. How have your designs evolved? We've expanded and literally have something for everyone now—from lucky charms and protective icons to whimsical animal charms and symbols of affection. We've also added more color and design with trends in mind. You named Sydney Evan for your children, how does family inspire you? My family is everything to me. They inspire me to do the best I can, and I know their love is life's greatest blessing. I bring our spiritual values into many of my designs, and my children's playfulness inspires the whimsical side. Pieces like "Albert", my diamond bird in a cage necklace, were named by my daughter, Sydney. Travel is also a big part of our family life and the colors and textures I see on our adventures can often inspire the direction of a collection. 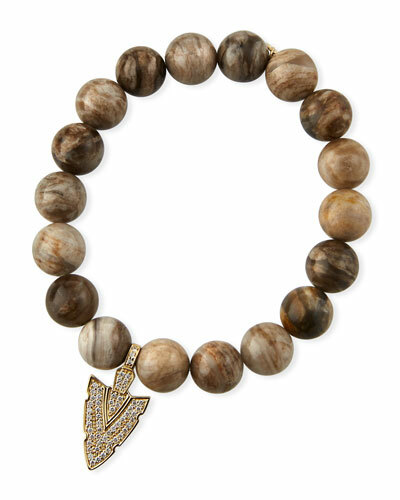 With an A-list celebrity clientele, Sydney Evan is one of the most sought-after jewelry designers in the world. 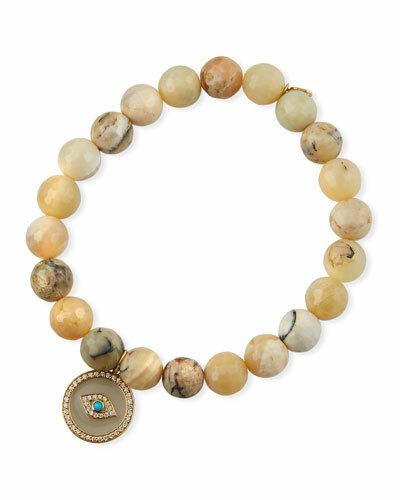 Whimsical designs, a stunning combination of semi-precious stones, and a focus of individual style are the foundation for Sydney Evan jewelry. 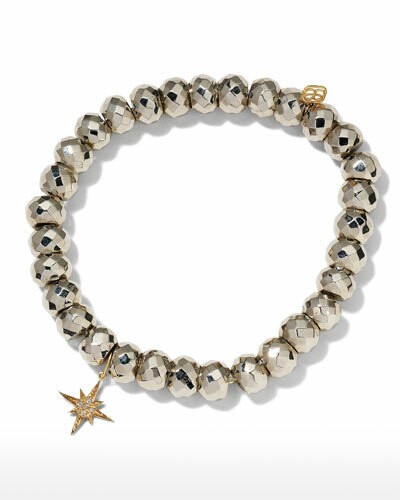 Neiman Marcus offers a highly coveted collection of Sydney Evan bracelets, rings, earrings, and necklaces. 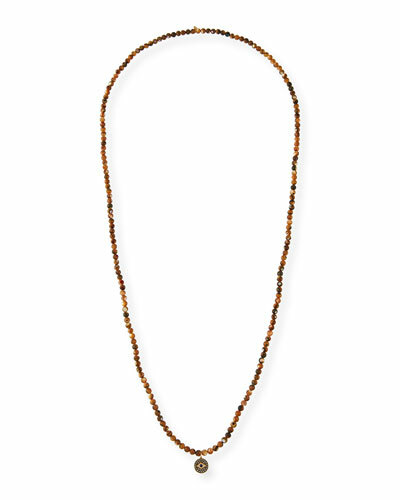 With every purchase Akola reinvests 100% of profits to empower women and families in poverty. 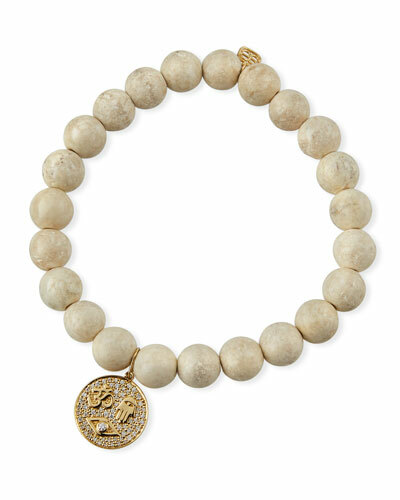 Akola stone and disc chunk bracelet. Textured yellow golden brass discs. Dyed freshwater cultured pearls. Labradorite and druzy beading. Stretchy; slip-on style. Made in USA. 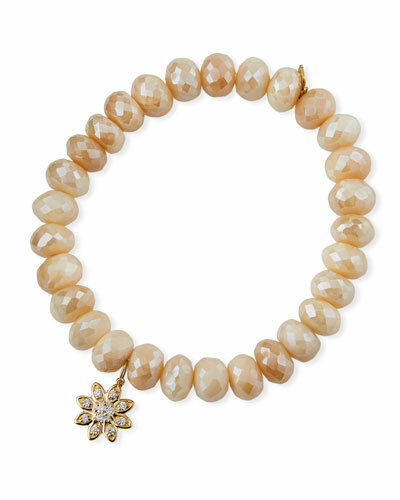 Armenta bead bracelet from the Old World Collection. 18-karat yellow gold and blackened sterling silver. Round multihued apatite and boulder opal beads. Champagne diamond pav?? yellow gold rondelle. 0.05 total diamond carat weight. Adjustable; pull-through style. Approx. 0.4"W (10mm). Made in USA. 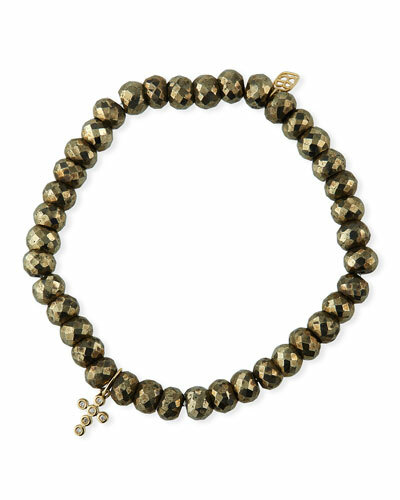 Armenta wrap bracelet from the Old World Collection. 18-karat yellow gold and blackened sterling silver. 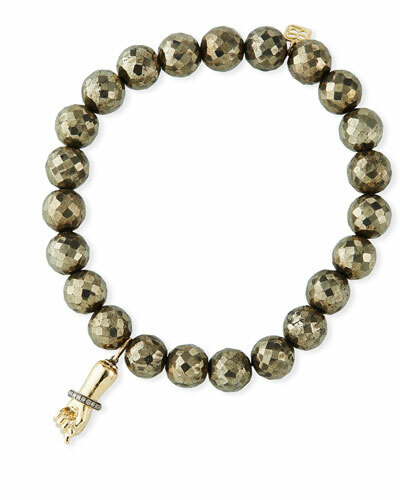 Pyrite and tundra sapphire beads with crivelli. 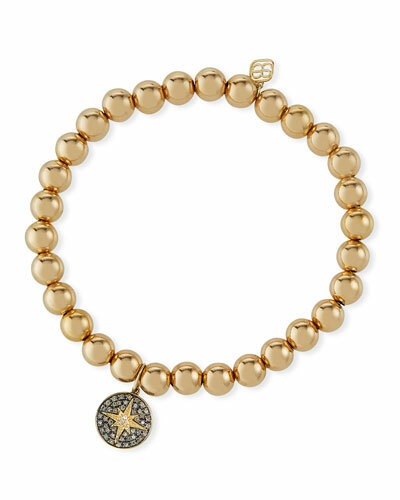 Gold crivelli charm with champagne diamonds. 0.04 total diamond carat weight. Toggle clasp. Approx. 21"L. Made in USA.